Printed Matter is pleased to announce a call for submissions for a new Emerging Artists Publication Series. Five selected artists will work with the support of Printed Matter and a dedicated designer to realize individual projects. Books will be published in a loose serialized format and share a common dimension, spine and colophon, but the content will otherwise be left to the artist. This Emerging Artists Publication Series is made possible by the support of the Jerome Foundation, and is open to individuals with a legal address in the five boroughs of New York City. Submissions are open to emerging artists whose practice has demonstrated a commitment to experimentation within the artists’ book medium in unusual and exciting ways. We would like to see proposals that give attention to the detailing of a strong concept, show an interest in process and technique, or that touch on the social, political, democratizing possibilities of the book as a form. We are interested in receiving projects we haven’t previously seen and that feel innovative to the artists’ book field. Broadly speaking, Printed Matter is interested in publications that have been conceived as artworks in their own right, rather than books that document work created in another medium. Proposals should not be a conventional catalog of artworks, traditional artists’ monograph, chapbook, or other straightforward works of fiction, non-fiction or poetry, as these fall outside our scope. Submitted proposals will be reviewed by a committee made up of Tauba Auerbach (Artist), David Senior (Bibliographer, MoMA Library), Garrick Gott (Consulting Design Director, Printed Matter) and James Jenkin (Executive Director, Printed Matter). Selected artists will have the option of working with designer Garrick Gott, who is available to help ready artworks and files for print. He will also assist with logistical considerations for production, including questions around paper stock, printing process and binding, and ensure the completion of the project within budget. 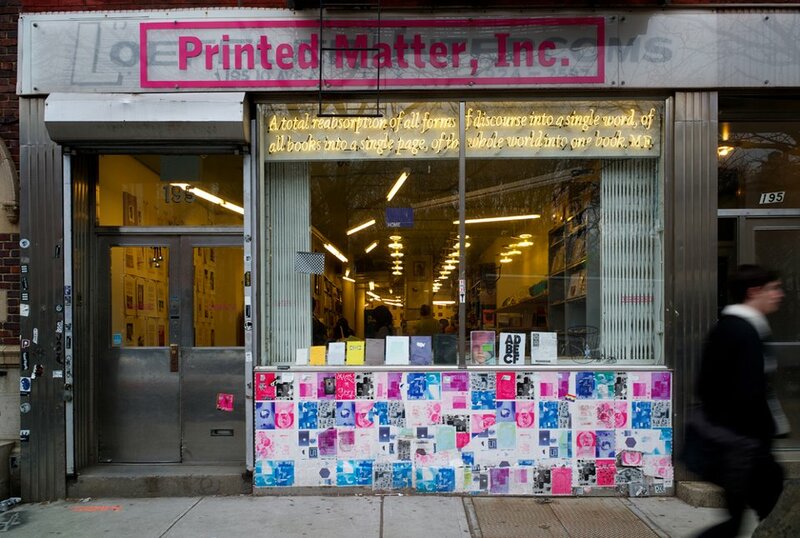 In addition to aiding the production of the book, Printed Matter is committed to offering full organizational support for the project beyond the publication date. This will include a press announcement, a launch event, the opportunity for an in-store and window exhibition at Printed Matter, and wholesale/institutional offerings to bookstores and libraries, as well as other support (see below). Your proposal should include work that best represents the intended project. Publications need not be in finished form, though we would like to see submissions that are carefully considered. While we have deliberately given some latitude, proposals should feel coherent and persuasively demonstrate to the panel how the project in formation will make a great book. You might consider submitting the following at your discretion: a detailed project summary, examples of previous published or applicable work, images (with captions where appropriate), composed or found text, other source material and fragments. We ask that you please do not overwhelm the judges, and that your proposal focuses on quality and not quantity. Be sure to include contact information, including full name, address, telephone number, and email address. All items should be sent as attachments in a single email to submissions@printedmatter.org, with the subject line EMERGING ARTISTS_[YOUR NAME]. Emails should not exceed 10 MB. Unfortunately, due to the expected volume of submissions, we will not be able to acknowledge the receipt of applications, and will only be able to notify selected applicants. All book proposals must be sent by Monday, August 10, 2013. Any applications sent after this date will not be considered. Selected applicants will be notified by September 10, 2013 with the expectation that work on the first two scheduled projects will commence in the following weeks. The five books in the series will be published over the course of a year. Among the various non-profit services and activities provided to book artists, Printed Matter has a long history of working to support artists in the production of new books. The launch of the Emerging Artists Publication Series is one of three streams in a newly revised publishing effort that strives to offer new opportunities to a diversity of artists. A second branch will embrace works with a strong social or political conscience, including overlooked classics, and other projects that are important to the field of artists’ books as a whole. Lastly, the program will undertake a series of more ambitious projects aiming to showcase some of the exciting possibilities with regards to technical production of editioned book works, including our pop-up book with Tauba Auerbach, [2,3], and Sam Falls’ STUDIO SPACE PRINT / TIME. Please note that outside of this particular call for submissions Printed Matter does not take unsolicited book proposals.